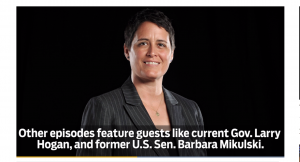 Heather Mizeur’s “MizMaryland: Soul Force Politics” nonprofit is partly a philosophical movement, partly advocacy training for people who want to work on social justice issues and don’t know how. Today, she’s re-emerging on the Maryland political scene with a new organization that has the goal of bridging the deep political divisions in society. “It’s more about a shift in culture, and how we deal with each other,” she said. “There’s a belief — and it’s belief that holds things together — and it’s that belief of ‘us’ against ‘them,’ ” Etheridge says. 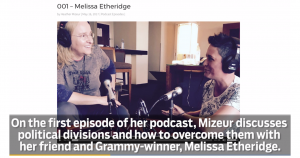 The women discuss how Mizeur helped Etheridge shape her views over their eight-year friendship, and how Etheridge counseled Mizeur through the devastation of losing her bid for governor by insisting there was a silver lining.